I love your skirt, and your belt. So chic! This may be a silly question..but how do you stuff the sleeves of that top into the leather jacket? Love love love this! The belt makes all the difference, and the shoes are just so classic and chic, great styling! Oooo Love this look! It’s simple, clean and elegant! Loving this super polished look so much, especially that skirt! <3 🙂 Super cute! Simple and stylish. It couldn’t be better! I also have this top in black. I loved it so much that I also bought it in a fushia color. I love your classic yet fashion-forward look. My first blog reading of the day! i lve this outfit so much! Great office look! What lip color are you wearing? So flattering! Beautiful outfit. I wonder if you would consider doing a post styling a black skirt several different ways. Maybe a black leather pencil skirt also, Talbots has a nice one right now. Hi Grace ~ a leather pencil skirt is on my wishlist! A black pencil skirt in general is forever classic but often overlooked … I did a post with mine in August and will have to bring it out again soon! Love your hair in a ponytail! Could you please share how you could keep the belt stay in place and not sliding up and down? Thank you, Carmen! I usually have an issue with belts shifting, but not here because the belt is flat and wide, and the skirt has a defined waistband area where the belt happens to sit securely on. With skinnier belts, I sometimes use double sided fashion tape, or if it’s really skinny I’ll loop a safety pin around at both sides as a fake “belt loop” to secure the belt down. I love that top! The bell sleeves are such a chic addition and the colour combo is fabulous! Looking classy and stylish as always! Love your sleeves tip! hi jean, does the tory burch parker small tote’s straps feel like they will break/wear if the bag is filled with heavier items ? also, what size is the laptop you tote around? Hi Sue! My laptop outer measurement is 12″ x 7.5.” (I can’t go by the usual diagonal screen measurement because there’s something weird about my screen). The straps are thin so honestly I can’t speak to how it will feel with a 32oz bottle in it, but I do carry a decent amount and the straps haven’t bothered me (yet)! Hi Jennifer – it only really smooths out for me when the skirt is thick and lined. This one is a thick wool one with lining, so is great for tucking! I like how the camel wool skirt gets a little edge from the leather jacket especially since I feel the skirt can get too formal for me. The leopard pumps spices it up as well! That looks like a great work bag – is the one you are carrying actually the “small” Parker Leather Tote or is it the regular size (large) one? The bag in your photographs looks quite large. Hi Laura! Yes it is the Small … the regular size is very generously sized against a petite frame. SO Stylish and classy. The overall look is just perfect. The shoe is the addition to it, just loved it!!!! This is the perfect fall office look! I need a camel skirt! I just love your blog. I love how you really give a lot of details with each piece of clothing. It really helps me when I’m making my purchases. Keep doing what you’re doing. Because of you my style has improved. P.S. I just bought some clothes using the links from your other posts. Thanks so much. You are the BESET DRESSED person I have ever seen!! LOVE your style! Question about the belt. Talbots no longer carries the black belt in a small. Do you have any recommendations for something similar anywhere else? Love this! Would you be able to tell me what color highlights you get? Your hair always looks so great! Thanks! Thank you, Florence! I ask for highlights in a cool, medium brown tone. My hairdresser never tells me the color she ends up putting in since it differs. I just make sure to specify cooler toned instead of warm, since a warm brown can come out brassy on my dark hair. Thank you so much! Mine always seem brassy so I’m definitely going to ask for cooler toned. Very very random – but have you ever thought about any of those cute work backpack? I see them around (Everlane etc. ), and have considered one, but have not pulled the trigger on anything. Just wondering, because your reviews are so spot on of bags, and I would love to know your thoughts! Hi Lindsay … are you looking for a laptop bag? I know Kate Spade makes one https://www.shopbop.com/inch-nylon-tech-backpack-kate/vp/v=1/1532342265.htm?fm=search-viewall&os=false and I also just received a Samsonite one (style name Zalia) as a gift that I was surprisingly very impressed by! I haven’t tried Everlanes or any other brand that isn’t specifically designed for a laptop. That belt is cute. Love it girl. Did you shorten the sleeves on the faux leather jacket?? That final photo is badass – no smile and looking into the camera. And the clothes are great too. Thanks for all of the wonderful advise. I love the leather jacket! Can you give a short review of it. Should I be hesitant of the shoulder pads? It looks great on you. Bought this skirt and it’s perfect. My one stop source for amazing petite items and great deals. I love your blog! I seriously can’t get enough of pencil skirts, love the color of this one! My current obsessed is robin b.’s pencil skirt because I love the midi length, so many petite people think they can’t pull off that length but I’m only 5′ 2″ and I love the way it looks (with the right shoe, of course). 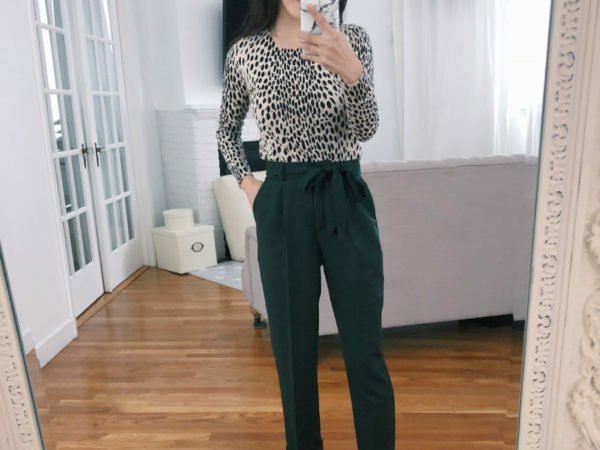 Thanks for sharing looks for petites, because it can be so hard to find good pieces. Here is the link to my current fav. skirt! By the way, love how your blog is organized by season and occasion, such a great idea!